Artificial intelligence (AI) is transforming business practices and the labour market across all industries, upending how leaders look at structural issues within their companies. While AI is often associated with the tech and finance sector, media has and will continue to incorporate artificial intelligence into every facet of the industry in the coming years. According to McKinsey Analytics, within the media sector, AI is expected to add the most value to the marketing and sales side of the industry, adding a projected 300 billion in value to that area alone. 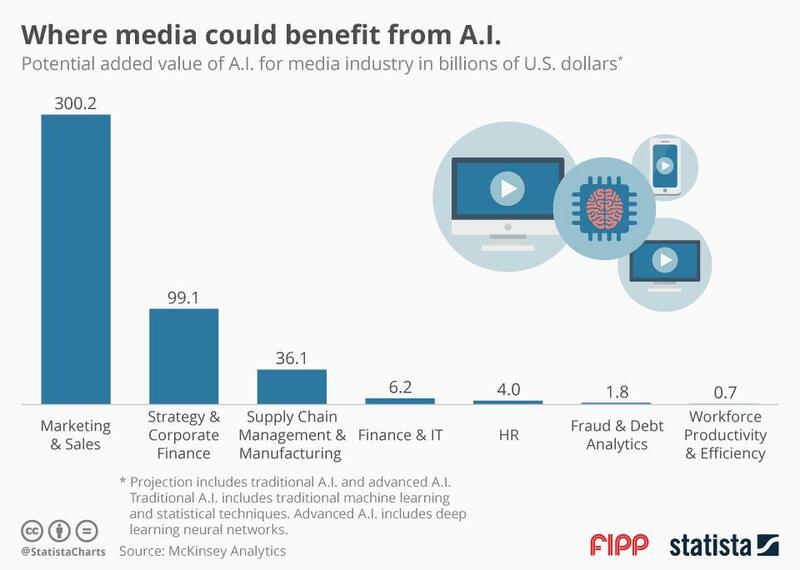 The strategy and corporate finance subset of the media sector are expected to gross US$99 billion in added value from AI in the coming years. Many of the areas within the media industry that are projected to gain the most value from AI, such as the marketing and corporate finance, will be expanding into traditional AI, which includes machine learning and statistical techniques, such as regression analysis. Areas where the potential added value of AI is currently smaller, like workforce productivity and fraud analytics arena, are projected to gain most of their value from advanced techniques being developed.